Any pool, whether in-ground or above-ground, can benefit from a custom deck. A wooden pool deck creates a custom space for you, your family, and your friends to relax and enjoy the water, the sun, and each other. It also provides a safe surface that can be made slip-resistant for when it inevitably gets wet. And a well-designed deck not only supports activity, but will improve the appearance and value of your yard as a whole. Strictly speaking, “deck” is a very flexible term; your above-ground pool could find its deck doubling as a patio, for instance. If the yard is large enough, you could even include an outdoor fireplace to enjoy a nighttime glow or cookout. All pools benefit from a deck, but a wooden deck specifically can offer maximum benefit. For instance, wood is a more flexible and softer material than paved stone or concrete. That means that anyone who slips and falls, such as an excited child running about, is going to be much safer on a wooden surface. Wood is also much more design-friendly than concrete. If your yard is large enough and the pool shape allows such a design, you could even create a bridge over your pool to make it easy to cross from one side to the other. Water getting on the bridge won’t be too much of an issue, just as it won’t be a problem with a wooden deck in general. Since the boards have small gaps between them, any loose water is able to easily drain away, preventing puddles from building up. Another advantage to wood is how it handles heat. Poolsides mean bare feet and no one wants to have to hop their way over a sun-baked deck to avoid getting seared. Wood can be tailored to resist heat absorption and provide burn-free comfort even under the midday sun. 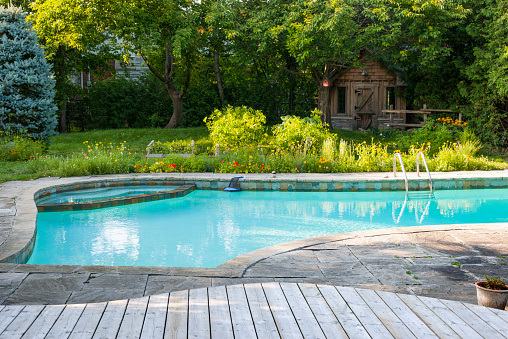 Toronto is a city full of different styles and preferences and wooden pool decks can be custom-built to suit each one. Ground-level decks can be built flush with the poolside for in-ground pools, while second- and even third-floor options are available for above-ground ones as well. The choice of wood can create a classy appeal or rustic cottage comfort and everything in-between or beyond. When stains, paints, and custom railings are mixed in, there are few limits to what can be accomplished. Total Fence Inc. is one of the top fence and deck installation contractors in the Greater Toronto Area. Our experts can walk you through the ins and outs of designing your ideal custom pool deck. Contact us at 416-239-5362 to speak with a consultant or visit our web site to learn the best way to get the beauty, utility, and safety a wooden deck can provide.